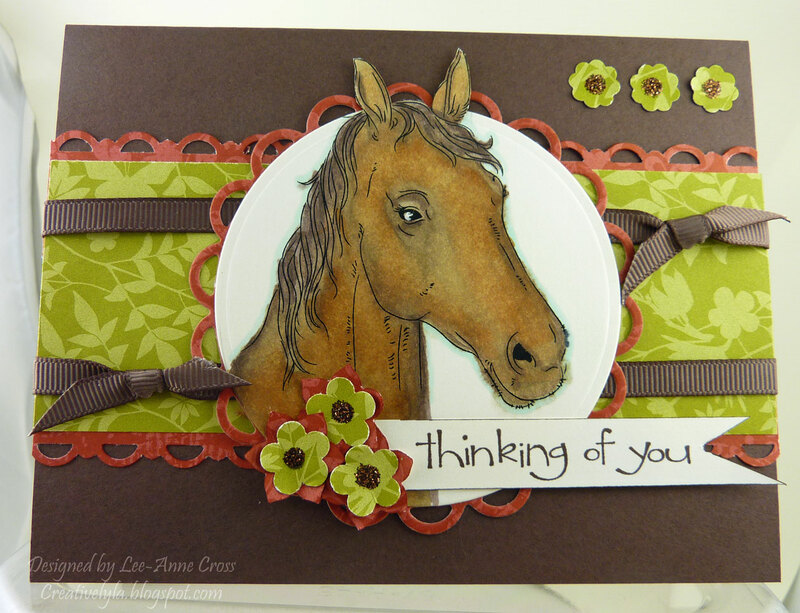 This card is for Jessica, the daughter of a fellow Splitcoast stamper, who’s been in a terrible horseback riding accident. This card is for three different challenges, the Color Challenge 327 and the Teapot Challenge 150 at Splitcoast and the Mojo195 Challenge. The digital image has been printed on vanilla cardstock and colored with Copics. It’s an out of the box design. You can find the tutorial from Splitcoast here. A touch of my Signo gel pen highlights the eye. It’s been layered on a piece of red designer paper cut with the Lacy Circle nestability die. A strip of green designer paper goes across the middle of the card with punched scalloped edges on the top and bottom. Two simple tied knots adorn either side of the focal point. The cardbase is a simple A2 shape in Chocolate Chip. The sentiment has been stamped in Chocolate Chip, hand cut and then edged with a Chocolate Chip marker. The flowers on the sentiment are layered with the same designer papers and a little bit of Stickles for some bling. The flowers in the upper right corner have the same Stickles added. Papers: retired Designer Series Papers from Stampin’ Up! in Riding Hood Red and Old Olive, Gina K. Ivory cardstock and Stampin’ Up! Chocolate Chip. Accessories: Wizard, Large Circles nestabilities, Lacy Circles nestabilities, 3/8″ Grosgrain Ribbon from Stampin’ Up! in Chocolate Chip, Chocolate Chip Stampin’ Write marker, Boho Blossoms punch from Stampin’ Up!, Itty bitty Shapes Punch Pack punch from Stampin’ Up!, Scallop Trim Border from Stampin’ Up!, Cinnamon Stickles, craft knife, pencil, cutting mat, Mat Pack from Stampin’ Up!, stylus, Tombow Multi and the following Copics: 0 Colorless Blender, BG10 Cool Shadow, E31 Brick Beige, E33 Sand, E37 Sepia, E43 Dull Ivory, E44 Clay, E74 Cocoa Brown, E77 Maroon, and E79 Cashew. Wishing you a wonderful Tuesday! This image is so cute! My daughter would be so inlove! I think you did a greatjob with this challenge. Thanks for sharing!